As air-breathing mammals cetaceans are bound to the water surface: They have to emerge regularly to breathe. Depending on the species and its particularbehaviour, this happens from several times a minute to just a few times per hour. Any time a whale or a dolphin comes to the surface there is a potential of being hit by a vessel. Mostly, during such incidents the animal will be rammedby the bow or the hull of a ship or boat. Maybe even more hazardous are situations when animals are hit by a propeller. Moreover, long and deep keels, daggerboards or stabilizers used in large ships can severely hurt an animal. Sometimes whales get stuck on the bow of a vessel and may be transported over hundreds of miles. Only when reaching the harbour, the collision might then be detected at all. This happened, for example, in Chile in 2009, in Antwerp (Belgium) during the same year, and a few years ago in Hamburg (Germany). Depending on vessel type and speed, such ship strikes result in severe or even deadly injuries. Many different types of vessels are known to have collided with cetaceans – there is hardly any exception. They include large ships like tankers, cargo vessels, cruise ships, naval vessels or ferries. Smaller vesselscomprise sailing and motor yachts, and many others, e.g. rubber boats or other out boarders, and even whale watching vessels. Vessels with unprotected propellers as well as those ones travelling at great speed, like fast ferries or high speed sailors, carry an elevated risk of collisions. It has been found that in large ships, the severity of the injury of an animal is directly related to the speed of the vessel. The number of ship strikes increased markedly from the 1950s – when large vessels customarily reached travelling speeds of about 14 knots (ca. 26 km/h) or more. Nowadays high speed ferries can reach speeds of up to 40 knots (ca. 75 km/h). Also, the number of ship strikes during regattas seems to be increasing, probably due to the fact that modern multihull vessels regularly reach velocities of 20 knots (ca. 37 km/h) or more. Magnitude of the threat: How many collisions do occur? 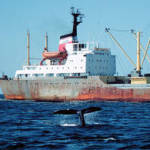 The actual worldwide number of collisions between vessels and whales still remains unknown. TheInternational Whaling Commission (IWC) registered about 1,000 cases from the last decades in its data base. But it has to be kept in mind that the issue as such has only been recognized for a few years. It is clear that dozens of collisions occur every year, with an increasing trend. But how high is the true number? This is the crucial question. Many scientists think that the true number is a multiple of the cases which are actually reported. The reason for that is that many collisions are not even detected or not recognized as being severe: To judge the severity of an injury inflicted on an animal often is very difficult, if not impossible. Many injured animals will probably die later, even if they have been seen alive just after the strike. Dead animals regularly sink to the bottom sooner or later, and only a fraction will be washed ashore. Even in stranded carcasses it will not always be recognized that the animal had been hit by a vessel. Besides, not every collision will be reported at all, be it due to carelessness or because one fears “bad publicity”, e.g. as a ferry or cruise operator or during popular regattas with a lot of media coverage. Which cetacean species are affected? It has been found that some large whale species appear to be more susceptible to being hit by vessels. Those species are the Northern and Southern right whales,humpback, sperm and fin whales. Some of them are either slow swimmers (e.g. the right whales) or are known to stay for longer periods of time floating on the surface (e.g. sperm whales). For the remaining population of North Atlantic right whales ship strikes are the primary mortality reason: every third animal dies due to a collision. In Southern right whales of South Africa, it’s every fifth whale. Moreover, in the Mediterranean Sea fin whales are very vulnerable. Off Hawaii, mostly humpback whales are being hit, while around the Canary Islands sperm whales are the primary victim. 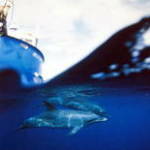 Although not well investigated, small cetaceans like dolphins or beaked whales are affected too. In any case, ship strikes are a growing problem on a global scale. But they are a threat not only to the animals but also to humans, because during many incidents people have been injured or even killed. When a jetfoil hit a whale in the Canary Islands in 1999, dozens of people were hurt and one passenger died. Similar cases were reported from Korea. Furthermore, there are several cases of sailing vessels sinking after having hit a whale. Often animals are sighted at sea carrying horrible wounds of unmistakable origin. On the other hand, after a collision at night time no one will be able to tell if a whale was hit or maybe a floating tree trunk or a lost container. Typical injuries are massive fractures or propeller cuts, abrasions and bruises, or hematoma. To be able to judge the mortality reason correctly usually great knowledge is necessary. Even experts sometimes cannot be sure about an according diagnosis. E.g., it is difficult to determine if an animal floating on the surface might have been hit after it was already dead and then became stranded. These are all reasons why there is no clarity about the true numbers of ship strikes. The global registration of ship strikes is just at the beginning. 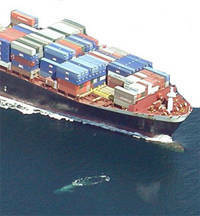 Where many ships operate and/or many cetaceans live, there is an elevated risk of collisions. Concerning shipping traffic, these areas are the well known shipping routes around the globe. On the other side, many cetaceans live above or along thecontinental shelf, and many migration routes or even resident populations can be found here. Hence, numerous known cases occur on shipping routes over continental shelves. In some areas there appears to be an especially high risk. In theNorthern Mediterranean Sea – large parts of which are a designated protected area for whales – the fin whale population is at risk of becoming extinct due to ship strikes. The cetaceans living close to the Strait of Gibraltar with its concentrated shipping traffic are also at risk. Likewise, off the East coast of the US there is a high level of vessel traffic combined with an abundance of North Atlantic right whales. Finally, a high number of ship strikes are reported from the Canary Islands. Other hot spots lie in the Far East, e.g. in Japanese waters and maybe many other places around the globe.